Sporadic blogging has hit the Quieter Moments blog as the holidays approach, family situations encroach and my work hours change. I’ve been stitching or playing depending on how one looks at things. But my much of my time has definitely been swallowed up by various issues and I’m feeling the energy drain. Here’s a few of the postable stitching samples. I’m still working on two large unpostable projects; one, blackwork and the other, hardanger. The hardanger is slowly progressing and the blackwork is moving right along. This is the first time I’ve done blackwork with so many colors. I have nine colors involved including some with very little contrast to the fabric. I wish some of what I’m picking up in these exercises would translate in to useful thoughts on other projects. I’ll have to wait and see. About all that is going on with the detached cable stitch variation are a few experiments with various threads. I don’t know why but recently I’ve been more willing to experiment with alternative threads. Some times I’m unraveling threads to get extra textures. I’ve been pulling threads out of an old blanket and some scrim. And then, too, I’ve making threads out of fabric strips; so far these have not been pleasing me. These experiments have been with quilting weight cottons. I think I need to go to semi-transparent fabrics. I’m feeling very restless in my stitching work at the moment. I’m stitching on a blackwork sampler. But it is not my own design and that is far from my norm. It is teaching me some things about how things must be designed for blackwork to be reversible. It is based on a old sampler, but I’m taking my liberty on the arrangement of the various motifs. 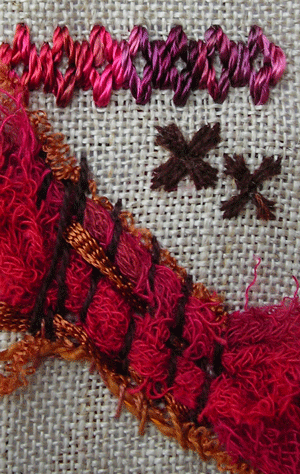 There is a great series of stitch study posts that Jeanne at Just String launched. This one is the detached buttonhole stitch. Previous to this one she did a post on the spiral trellis stitch both well worth reading. If you haven’t already seen them, do take time to swing by. I’d like to get my needle and thread and follow right behind her examples. Many thanks for these excellent posts, Jeanne! I’m not a person who enjoys finishing my needlework project into some practical object. I love stitching, but the finishing involves all these little unseen details that need to be attended to. However, since Christmas and giving gifts is on my mind, I’ve been paying attention to the details that allow corners to be square, seams to be flat and “wear and tear” spots to be re-enforced. While I was working with this item. I was noticing some of the details that I’m almost unthinkingly willing to put into a design. 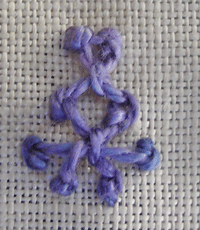 For instance, the one over one purple stitch on the top border. Here I wanted the center flower on each outer border to stand out more than the other two. So I added a fly stitch to each outlined rice stitch. I’m not sure if that succeeded. Another detail factor is consistently crossing all the cross stitches. I accomplished that but failed to consistently weave the little white pyramid shapes along those same borders. That catches my eye in the wrong way just like an unsquared corner. I’ve been stitching a blackwork sampler in all the spare moments I have. Details abound in this piece. It’s almost a game to see if I can find the main trail, take each side turn at the right time and turn around to backtrack before I go too far down those side trails. Now where is something I can stitch and forget about details?